I don’t usually buy art at a local diner but this piece somehow jumped off the wall at me. I live in the Pacific Northwest so rain-drenched views are very familiar. The mood of TORRENT for me is one of life within the rain, of urbanity in nature. What takes this picture beyond the studio and into my home is the gulf between my talent with words and what I see others see. This piece captures that for me. 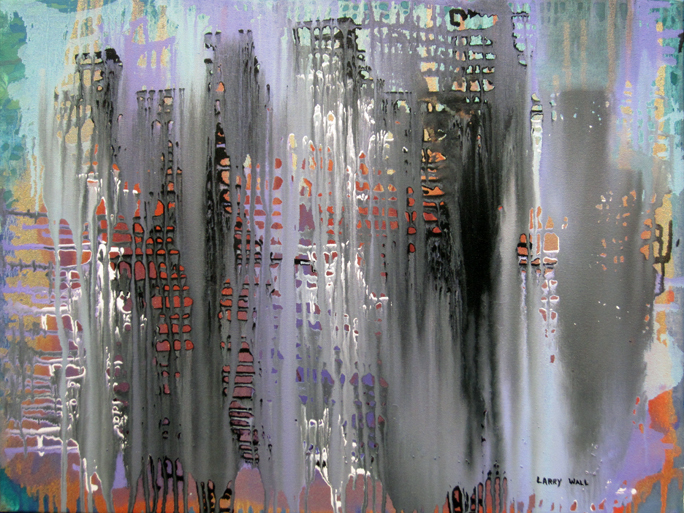 The tag says Gallery Wrapped Giclee on Canvas 24″x32″ painted November 2011. I reached out to the artist Larry Wall who graciously granted his permission to share it here. Check him out. As a book maker, I admire the productivity of others and I salute all who balance making a living with having a productive life and still have time for love. A Digression on Reading by indie author-publisher Kathleen K.
Perhaps the report’s most remarkable finding, however, is that 62 percent of Americans under 30 believe that there’s a lot of important information that exists outside of the Internet, while only 53 percent of older Americans believe the same. Millennials, it turns out, are the keepers of that (old, adult) Socratic idea that the more one knows, the more one understands how little one knows. They must have read that in a library book. I hate the misconception passed around that people don’t read any more. People who didn’t used to read don’t read now, people who don’t realize the benefit of reading don’t read, people who don’t have the presence of mind to value the unique communique of words arranged to lead you somewhere specific aren’t picking up books, people who fixate on reality TV aren’t at the library. You know who reads? The curious. The inquisitive and acquisitive… the seekers not just of information but of communion, of shared ideas, these are the people that read. Surveys say a lot of things but most readers aren’t wasting time answering surveys: they’d rather be reading. I simply cannot credit the quantification of a cultural resource like reading based on mainstream book sales, mall surveys or online clickity-clicks. The questing of a personality for meaning, advantage and context is enriched by the ideas of others and reading remains a primary source. Insofar as age affects your stage in life, and some stages are busier than others, let’s exempt anybody in the clutches of life-work from being dismissed as a non-reader: if your time is being gobbled by kids, career, extended family, military service, I get that books can be really heavy to carry around in your head at the moment. If you are usually a reader but don’t find time to read at some points in life then I don’t worry about you. You’ll be back. To my rowdier readers, thanks for the encouragement. With the publication of my twelfth book, the core Private Publications – Words Arranged by Kathleen K. are in print and Kindle. I’m sidetracking toward the production of audio-versions for my long-haul fans. Looking forward, there are more books to come, already written. I am literally gambling that people do still read… and always will. I am a big fan of industrious people, it’s an extra pleasure to share some of your energy with others. I like to put the focus on reading books from time to time, it’s a refuge of sorts as you describe. As writers, the link is even stronger since we read the story and judge the writing. So much to learn!